Home / Green Building / Need Help to Evaluate Green Building Products? Need Help to Evaluate Green Building Products? Evaluating green building products just got easier with National Renewable Energy Lab’s (NREL) new web portal. Commercial building engineers and designers are often approached with novel or underutilized clean energy technologies and products, says NREL, but when they can’t verify performance claims, they usually don’t take action. 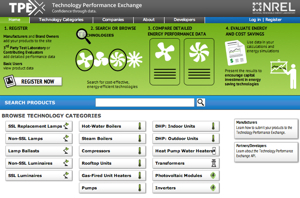 To remedy that, NREL developed the Technology Performance Exchange (TPEx). It provides energy performance data needed to evaluate these technologies, making it easier for promising energy efficiency and renewable energy technologies to be adopted in the marketplace. Using TPEx, everyone from individuals to manufacturers and utilities can find data that allows them to learn about and compare building-related products. You can browse products to find the best one for a particular use – products are currently in 17 categories, from lighting to HVAC to solar PV modules. The idea is to help companies with promising technologies to get through the "Valley of Death," the phase after developing a product but before it gains commercial traction. Those that want easy access to lifecycle research on building materials products should check out "Tally," software developed by architecture firm KieranTimberlake. You can tailor the results in terms of areas of interest, such as embodied energy or global warming potential. This is important because as many of you know, lifecycle analysis is time and labor intensive. And Tally makes the data available during the design phase which is when these decisions should be made. Homeowners and contractors can use Home Depot’s database to find appropriate products, which was built in conjunction with the US Green Building Council.